At first thought, we really wondered what case scenario would best fit a pocketable Bluetooth keyboard. Considering that the FAVI Mini Bluetooth Keyboard can be tucked away in your pockets, some would naturally think it’d be an ideal companion for many of today’s gadgets – like tablets and smartphones. Even though we’d prefer a keyboard that’s more full-sized, we soon realized that there is one perfect case where the FAVI Mini Bluetooth Keyboard best fits in. 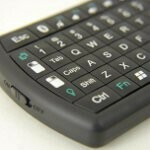 With its pocket friendly size, we find that the FAVI Mini Bluetooth Keyboard is best used on the couch. Yes folks, you heard that right – the couch. Actually, we paired it up to a Motorola DROID RAZR HD, which we connected to a high-def television via its HDMI-out connection. Seeing that there’s a very useful built-in trackpad on the FAVI Mini Bluetooth Keyboard, we’re able to navigate through the UI of the phone with no issues at all. Also, it helps that there are left/right mouse buttons to ease the navigation too – especially paired to any Windows/Mac PC. As for the typing experience, we really can’t complain about it, since the buttons are adequately sized for the pocket-size of the keyboard. Bubbled in the center of each button, there’s enough distinction between them – and that’s despite the fact they’re crunched up next to one another. At the same time, there’s a nice responsive click feel with every press. Showing off its usability, we also appreciate that there is a dedicated row for numbers, and another set for various media functions. Finally, the FAVI Mini Bluetooth Keyboard is great for presentations as well because it’s also packing along a red laser pointer – so there’s plenty of fun with it. Rather than relying on usual replaceable batteries, it’s comforting to know it’s using a rechargeable one instead. And if you plan on using this with a PC, it’s great that the USB Bluetooth adapter is neatly tucked away into the body of the keyboard (where the battery is located) when it’s not in use. Honestly, for $50 you’ll need to fork over to pick this up, there’s plenty of value in the FAVI Mini Bluetooth Keyboard – plus, it’s a versatile tool! I had to go back to the top to see if it was flagged as an advertorial.